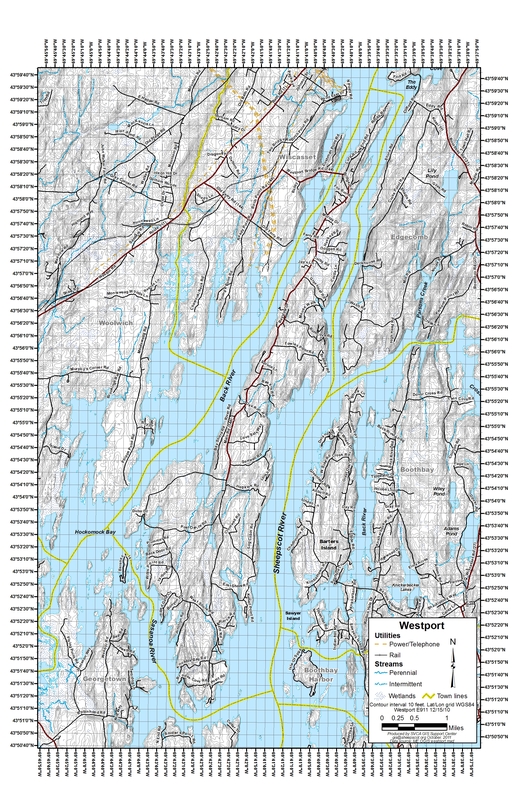 A blog about "Life on the Rock"
Westport Island is accessed via a bridge from Wiscasset. The header photo is taken from the bridge facing the Island. The bridge is emblematic of the Island and is important to the Island character. Two osprey nest each year on the Westport side of the bridge signalling the arrival of spring: when they leave, fall has arrived. 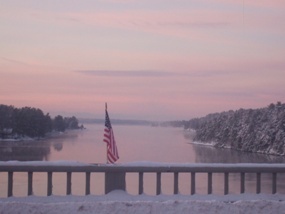 In 2007, the bridge was lined with small American flags — a tribute to honor soldiers in Iraq and Afghanistan by parents of a Westport Island soldier on deployment. After the flags were torn down and vandalized six times, Maine law enforcement officers supervised their replacement as a signal to passersby of respect to the Island parents and to all soldiers. The header photo was taken before the flags were all replaced. Posted on February 10, 2012, in Everyday Life and tagged bridge. Bookmark the permalink. 2 Comments. Thanks for the addition to the bridge “lore”! See the upcoming Westport Community Association Calendar on the Bulletin Board page — and better yet, see the Westport Community Association website under the Bulletin Board menu. Saturday, April 20, Spaghetti Dinner Fundraiser, 4:30-6 pm, Old Town Hall, 1217 Main Road. Come neighbors and friends to a community spaghetti dinner courtesy of Chef Nita with salad, rolls, dessert & beverages. All proceeds benefit the Westport Volunteer Fire Department. Saturday, May 4, Annual Island Cleanup, 9 am, Old Town Hall, 1217 Main Road. Spring is here and it’s time to clean up and welcome summer! The Conservation Commission will be hosting the annual Island Cleanup. Meet at the Town Hall at 9 or thereabouts to get an assignment and pitch in to keep our island green. Vests and trash bags as well as coffee and refreshments will be available at the Town Hall. Saturday, May 18, Community Association Garden Plant Swap & Sale, 9-11 am, Old Town Hall, 1217 Main Road. Bring a plant or two to swap or just bring yourself and find the perfect fill-in plants to energize your summer garden. Tuesday, June 11, Municipal & RSU #12 Election, Old Town Hall, 1217 Main Road. Municipal election for First Selectman and Road Commissioner and RSU #12 Budget Validation Referendum. Saturday, June 22, 9:00 a.m., Town Meeting, Old Town Hall, 1217 Main Road. 52,490 Checking out "Westport Island"